Earlier this year the IET Archives was very fortunate to receive a donation of the records of the Decca Navigator Company. This company owned and developed the Decca Navigator System, probably one of the UK’s major contributions to radio navigation since WW2, a radio navigation system that allowed ships and aircraft to determine their position by receiving radio signals from fixed navigational beacons. 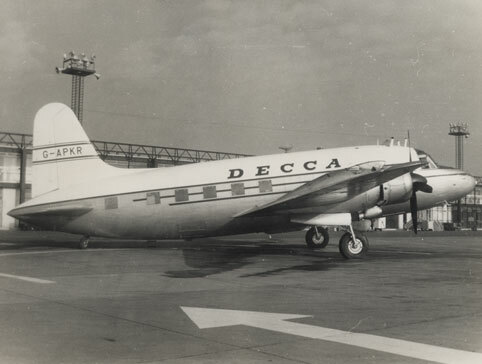 Decca Navigator did not have its own formal archives, but a former senior employee of the company, who took a great interest in its history, had maintained close contacts with the Managing Directors of the company and collected the company’s records from these individuals over a period of time. This is therefore not a corporate archive as such but instead the records of a company collected by its senior managers. In addition to information about the history of the company and its formation, there are records related to the senior managers in the company, its finance and sales, technical articles and research, photographs, and perhaps the only complete set of the Decca Navigator house magazine in existence (1949-1981). 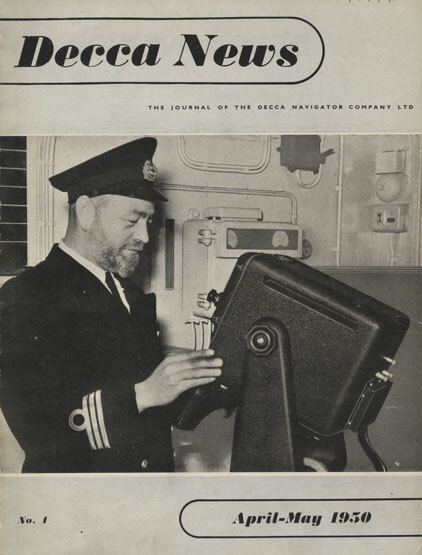 The image above shows the cover of the first issue of Decca News, published in 1950, which became Decca Navigator News in 1951. The image shows Chief Officer of the S.S. British Merit, W R Mowbray, using a recently installed Decca Marine Radar, type 159. The IET Archives is also very grateful to its volunteer, Eric Everatt, who has catalogued this collection which has been described at item level. Without Eric’s assistance it would not have been possible to catalogue this wonderful collection in such great detail. An engineer, William J O’Brien, had the idea of position fixing by means of phase comparison of continuous wave transmissions in the period 1936 to 1938. This wasn’t the first such system but O’Brien made some progress with it and undertook experiments in 1938 in California. Both the US Army and Navy considered O’Brien’s idea too complicated and the work ended in 1939. O’Brien was a friend of Harvey J Schwarz, Chief Engineer of the Decca Record Company in England and he sent details of the system to Schwarz in 1939 to put to the British military. Robert Watson-Watt reviewed the system, but did not follow it up considering it too easily jammed. However, in October 1941 the British Admiralty Signal Establishment (ASE) became interested in the system, which was then classified as Admiralty Outfit QM, and marine trials were conducted in 1942. 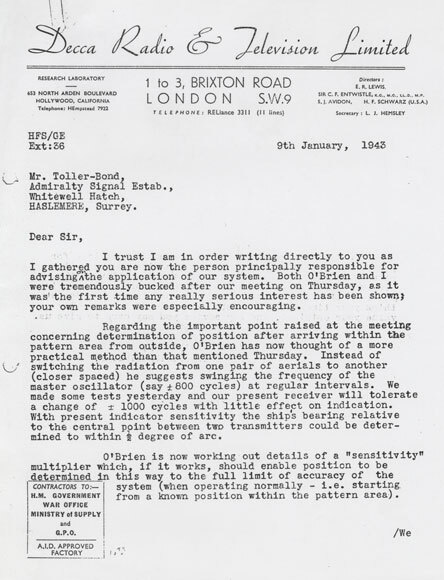 A copy of the letter from Decca Radio to the ASE regarding its interest in O’Brien’s navigation system, dated January 1943 is shown below. Further trials were undertaken in April 1943 and January 1944 by which time the competing Gee system was known to the Admiralty. The two systems were tested head-to-head under the code names QM and QH. QM was found to have the better sea-level range and accuracy, which led to its adoption. 21 minesweepers and other vessels were fitted with Admiralty Outfit QM and on 5 June 1944, 17 of these ships used it to accurately navigate across the English Channel and to sweep the minefields in the planned areas. The swept areas were marked with buoys in preparation for the Normandy Landings. Decca Navigator Company Limited was formed in 1945 after the end of WWII as a subsidiary of Decca Records, and the system expanded rapidly, particularly in areas of British influence. Decca’s primary use was for ship navigation in coastal waters, offering better accuracy than the competing LORAN system. Post WWII fishing vessels were major users but it was also used on aircraft. Two of Decca’s test planes are show below (the first image is of a Vickers Valetta aircraft). At its peak Decca’s Navigator System was deployed in many of the world’s major shipping areas and more than 15,000 receiving sets were in use aboard ships in 1970.The system was employed extensively in the North Sea and was used by Helicopters operating to oil platforms. Decca Navigator was acquired by Racal in 1980 which then merged Decca’s radar assets with its own. As the patents on the original Decca technology expired in the 1980s, Decca suffered at the hands of competitors, and its income declined. Decca was eventually replaced, along with LORAN and other similar systems by GPS during the 1990s. The Decca system in Europe was shut down in the spring of 2000, and the last worldwide, in Japan, in 2001. The Decca Navigator Company collection has been catalogued with an archive reference NAEST 228 and is available to consult at the IET Archive Centre, Savoy Hill House, London. After this blog about the Decca Navigator Company was originally posted, Richard V Glenister kindly provided the two images below which show a Decca Plot trace taken during a search for a wreck and also a photograph of the plotter. The equipment was on the Salvage Vessel Droxford being used during a search for S. S. Boniface which had been sunk by a German submarine in World War I. Richard mentioned that the Decca model shown was a Decca Navigator Mk. 12 Multi Pulse with an associated Decca track plotter type 350. The radars used were a Decca Type 46 and Type 45. The IET Archives was recently contacted by the family of Commander D M Vaughan-Hughes, who was captain of HMS Fleetwood, F47, shown above, during Decca Navigator sea trials off Chatham in 1951/52 (Operation Arcachon). They very kindly shared with us an album of photographs taken during these trials which in addition to showing many of the crew also show many Decca staff including W T Sanderson shown below. There is a story passed on to us by the family that when HMS Fleetwood and other ships could not return to harbour because of fog, Commander Vaughan-Hughes declared that as she had the most up-to-date radar in the fleet she would lead them in, which she then did. Our grateful thanks go to the family for sharing this story and the many photographs (20 in total) of which we have retained copies by permission in order to share with future Decca Navigator researchers. Very interesting especially, as a Radio Electrical Artificer I was instructed on the system and also saw it used conducting a box search for a wreck onboard Risdon Beasley’s SV Droxford off the West coast of Ireland (Bloody Foreland) using Decca Plotter in the mid 1960’s. I took a quick look through the Decca Navigator News publications of the 1960s to see if SV Droxford mentioned in any main articles. I didn’t spot anything but it would have been easy to miss, if mentioned, amongst the many small news snippets detailing ships that had just installed or were currently using the system. If you send the image of the plot and photo of the plotter to the IET Archives e-mail address I can edit the blog to add the images and related information at the end of the original blog. The IET Archives e-mail address and other contact details can be found on the new Contact Us page on this blog. Unfortunately the Decca material that we have contains very few technical records. I’ve looked at the Decca Omnitrac articles in Decca Navigator News (DNN) and couldn’t see any mention of Birdlip. Decca Omnitrack was first announced in the April 1960 issue of DNN. 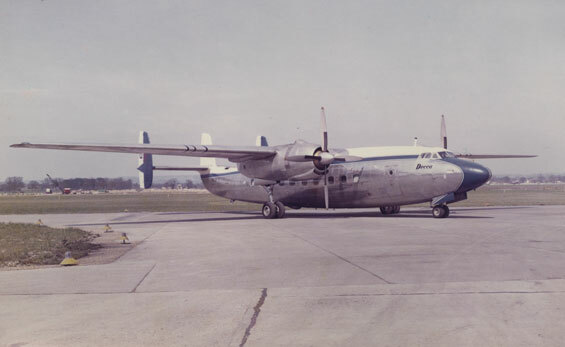 I note in the issue of Flight from 24 February 1961 (page 253) that it talks about BOAC flying tests on its North Atlantic route using ground equipment at Birdlip (the HF link equipment provided by Cossor rather than Decca). Details of the testing are provided in that article (Flight magazine archive is online), coincidentally underneath a brief piece about Decca HF link equipment. While this doesn’t help to answer your Decca question perhaps it helps to narrow down the date period for your investigations. Many thanks for that and it might be around the early part of 1971 that the VC-10 was involved but I’m sorry I can’t be more specific. I appreciate you taking the trouble and it was a ‘long shot’ in any case! My father, Cmdr.D.M.Vaughan-Hughes, was captain of HMS.Fleetwood F47whilst doing Decca Navigator trials in the sea off Chatham around 1951/52. In fact I went to sea on one occasion with him aged four or five. I have a photo album of the Decca “boffins” and RN crew if anybody is interested.